A memorable trip including both Singapore and River Kwai. Our group comprised of veterans and their families. The tour took place late october 2011. Bearing in mind the average age of our esteemed guest was age 90, we were mindful the chances of these fine esteemed gentlemen returning again- were quite slim. Therefore we were determined to do everything in our power to ensure we didnt let them down. See schedule towards bottom of page. Note. Its unlikely we will ever again undertake such a hightly ambitious tour. Indeed The British Legion cover this same itinerary very well. Our pre tour efforts involved spending weeks on extensive and exhaustive letter writing/ PR as well as pleas for cooperation from sympathetic ex pats etc. We managed to put together a special and genuinely unique tour which we can say with total modesty would be hard to emulate by any other tour planner anywhere. Not to mention keeping within a massively tight budget. Our tour price came to £1800.00 which was only made possible with a lot of voluntary support. The result of our really hard work bore fruit by way of us finding in Singapore -the “Wanderers” Rugby Club to whom we are eternally grateful. Made up of tough ex-pats working out in Singapore they provided us ‘gratis’ a 42 seater luxury coach (solely at our disposal) and as a surprise aarranged a trip to “Raffles” with all expenses covered including the best champagne. Not to mention private party at the ‘British Club’ and a cocktail party at the British Ambassadors private residence. At the River Kwai our host for the duration of our stay were the brilliant duo of Mr James and Mrs Noi Fanning. James an ex pat and his charming wife Nou looked after the vets throughout. James and Noi gave up their time voluntarily to cater and organise all the localish trips the hotel, absolutely everything was laid on by this wonderful couple. I personally am really grateful to them as well as Mathew in Singapore, for taking some of the strain off me. Especially bearing in mind being myself a pensioner and novice guide, this did prove to be a pretty exhausting although worthwhile trip. But I did Ok, I thought, putting all this together at the ripe old age of 66. Including Changi and Burma railroad. We will take a relaxing day. Get up late and just find our feet. If everyone is agreeable late afternoon to Raffles for tea and cakes. 09.00 Memorial servicekranji cemetery). Appointment- 1100 am Special permission granted to observe ChangiMurals located in ‘Hut 151’. Changi Museum and Changi Chapel. 19.30 hrs Buffet Supper at (UK’s Defence advisors)’s residence. We need to depart hotel 9.45 It’s around 14 miles to airport. As we will be fairly fresh after only a short flight we proceed on by mini bus direct from airport to the River Kwai. Remainder of the day relax, and general leisurely wander around. Visit to Kanchanaburi and Chungkai Commonwealth War Cemeteries. 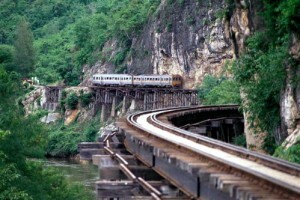 Travel along the Burma-Siam ‘Death Railway’ from Kanchanaburi to Namtok. Visit Hellfire Pass and Museum. Attend two Services of Remembrance on Saturday at Kanchanaburi and Chungkai War Cemeteries..
British Embassy held Service of Remembrance at Kanchanaburi and Chungkai Cemeteries. Also meet up with other groups of FEPOW veterans as well as British Embassy staff. Travel by long-tail boats along River Kwai and spend rest of day exploring and doing your own thing. Hopefully chatting to other veterans from various parts of the world. Bus to Bangkok. Afternoon short tour of Bangkok, canal cruise and visit to the Temple of Dawn. Trip to the Grand Palace and Rose Gardens. Morning and afternoon at leisure before overnight flight from Bangkok to Heathrow.Via Dubai. Fri 18 Nov at 07:05 Arrive home.